One of the organs present in vertebrates is the bone. It has various functions including movement, protection, and assistance to different kinds of organs in the human body. They are also the sites of production of white blood cells and red blood cells. They are an amazing structure that are very light weight and at the same time hard and strong. Mineralized form of osseous tissue is present in its core. It is a type of connective tissue. Calcium phosphate primarily makes up its structure. It is very brittle but substantially elastic. Its compressive strength is very high compared to its tensile strength. Bones are made of both dead cells and living cells. They have many different functions. Its mechanical functions include giving protection to the internal organs of the human body. For example, brain is protected by skull and lungs and heart are protected by rib cage. Another chief function is providing a frame for the human body to support itself on. It essentially gives shape to human body. One of the other important mechanical functions is generation of movement. Forces are produced by the muscles and transferred to bones by means of pulling them. Biomechanics covers these functional aspects of human body. Overshadowed hearing is dependent on sound transduction that is supported by bones. They are involved in the process of production of blood. Marrow is the location where blood cells are produced by Hematopoisis. 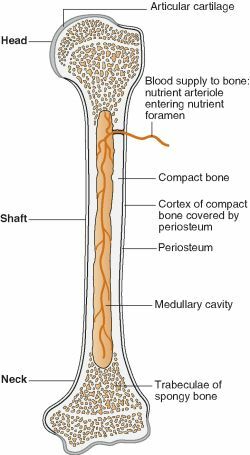 Marrow is present in the interior of the meduallar cavity of the longer counterparts. Storing of minerals is yet another important function. They are literally stores for important minerals including phosphorous and calcium. Several types of growth factors including insulin-like growth factor, morphogenic proteins and others are stored by them. Fatty acids are also stored in the yellow part of marrow. They have the potential to absorb or release alkaline salts thus acting as a buffer and affecting the pH change in blood. Bones also act as stores of heavy metals and foreign elements thus not letting it affect other parts of body by removing it from blood. It has several endocrine functions as well. They are made of 5 different types. The five types in the body are irregular, sesamoid, short, flat and long. Long ones are especially important for movement. They are present in all parts of the limbs of human body except for wrist, knee and ankle. Even toes and fingers have long ones. Short ones are shaped roughly like a cube. The interior of which is spongy. Ankle and wrist contain short ones. Flat bones are usually curved and unusually thin. Skull is made up of flat ones. Sternum contains flat ones too. Spongy tissue is sandwiched between two layers to form the flat ones. Then there are irregular ones that cannot be fit in any of the categories mentioned. They are irregularly shaped and are complicated in structure. Hips and spine often contain most of the irregular ones. The ones that are inside the tendons are called Sesamoid bones.